The follow up to the original smash hit! Sometimes you don’t want a three-hour class with all the details. Sometimes you just don’t have the time. Sometimes you just don’t have the need. Sometimes you just want some quick gentle reminders to put you in the mood and mindset to be a successful networker. That’s where the “Connections Quick Tips” series comes in. 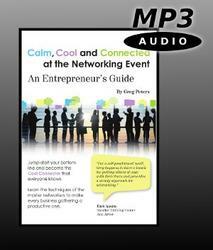 Put this program on your favorite audio player and listen on the way to your next event. You’ll pick up the tools, tactics and techniques to make your networking path go a little easier. From how to break the ice at a networking event to why even those who aren’t entrepreneurs still need the skills of networking, you’ll uncover your inner networker with the help of these thirty-one short, focused lessons.